Conventional vehicles can get to Cape Buffon and Boozy Gully from Southend and Oil Rig Square/Geltwood Beach via Millicent. Rugged limestone cliffs, the sea, islands, sea-stacks and offshore reefs can be viewed from the 3 walking trails in the northern section of the park. Several spots along the coast are popular for fishing. 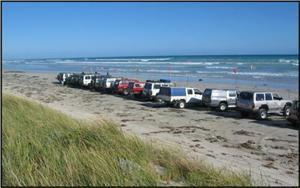 4WD vehicles can travel the full length of the park by following the orange marker posts through the dunes which change regularly. Plan your trip within your capabilities, take adequate provisions, travel in company, attach vehicle flag, carry recovery gear and spares for vehicles. 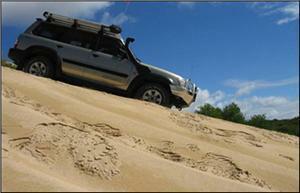 Check the route, read Canunda National Park information and remain on tracks. 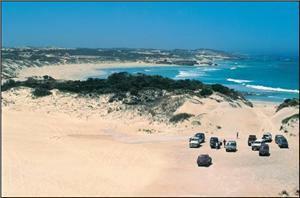 Beach driving south of Oil Rig Square is not recommended. It is recommended that tyre pressure be lowered to 15 psi.